With the weekend approaching, you’re probably figuring out how to best enjoy your free time. If going to a live performance is part of your agenda, you may be interested in today's custom wallpaper project. Nowadays it’s much more acceptable to take photographs at a concert, and that is the project we’re proposing: creating a custom wall mural from your favorite live concert shot. Now, taking in recording equipment and getting bootlegs of the concert is another thing altogether, and if the artist requests not to be photographed that needs to be adhered to. The wall mural image from the inspiration room is a shot from a recent Phish concert held at the Gorge Amphitheatre in Washington state. The mural’s incredible colors streaking through the air are glow sticks. The amphitheatre itself provides a stunning backdrop for these vibrant accents of color. Stage lighting in general will always give a wall mural a very cool look. Saturated tones of blues, reds and purples stand out nicely against darker areas of a venue. 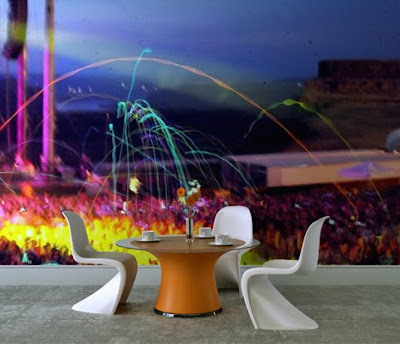 Even the crowd, not the performer, can become the star in your wall mural. So if it’s not frowned upon, take your camera to your next concert experience and capture some shots, one of them may be perfect for our own custom wallpaper installation.